How to watch Black Butler: Season 1: His Butler, Up in Flames on Netflix USA! Yes, Black Butler: Season 1: His Butler, Up in Flames is now available on American Netflix. It arrived for online streaming on December 1, 2018. We'll keep checking Netflix USA for Black Butler: Season 1: His Butler, Up in Flames, and this page will be updated with any changes. The Young Master arrives in London, only to find the city engulfed by flames. 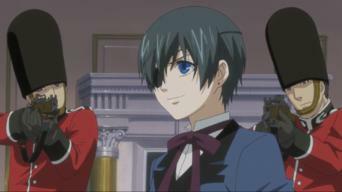 After an ominous warning from the undertaker, Ciel attempts to visit the Queen, but he's shocked by his treatment at the hands of the palace guards.